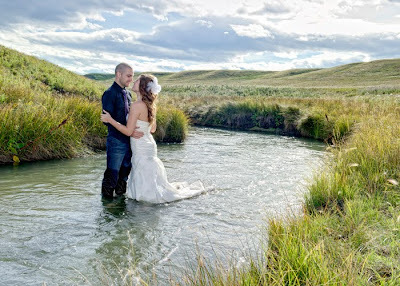 Urban Vows: Trash That Dress! A trend that I am not yet one hundred percent comfortable with is the TTD sessions. Trash the Dress sessions are becoming more and more popular and maybe I am uncomfortable with it because I can't see myself being cool enough to do this myself. I mean, you really have to detach yourself from the item at hand here ("the" dress) and me being the person that thinks Christmas Trees have feelings and as a child gave each stuffed animal equal snuggling rights in my bed, I tend to really attach myself to non-living objects. Seeing that weddings are something I wake up and go to bed thinking about, could I really destroy that focal point of my big day? I have gathered here some examples of these daring brides and give them so much credit for several reasons: One - you have realized that your dress does not have feelings (unlike the Christmas trees that don't get picked at the lots!). Two - you are willing to step out of the box, and possibly take criticism from your grandmother amongst others. Three -you have braved elements such as mud, cold and swamp water in order to get that killer shot! What do you think? Could you do it? I mean, look at these stunning images, including some local talent - check out the credits if you're interested in taking the plunge (like...literally! ).